Looks like it’s going to be a rough Saturday for Tesla’s IT department: they’ve just had both their website and Twitter account hijacked. Update, 3:50 P.M: Tesla CEO Elon Musk’s personal Twitter account was seemingly hijacked briefly around this time, as well. 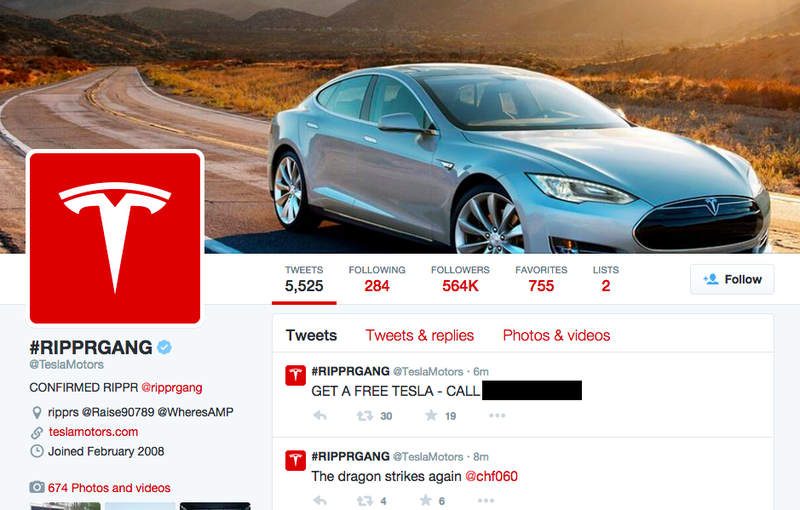 A few minutes later, the account began promising free Teslas to those who followed certain accounts or to those who called a certain phone number. A quick search suggests that the number belongs to a computer repair shop in Illinois, and was presumably tweeted out to flood the number’s owner with calls. We’ve censored the number in the above screenshot for obvious reasons. Update: At around 2:45 P.M pacific, or roughly an hour after the Twitter account was compromised, it was restored. Tesla’s site is still offline. It’s not unusual for a high-profile Twitter account to get hijacked — many of the most followed accounts in the world have fallen at one time or another. Taylor Swift’s account, for example, was hacked just weeks ago. That both Tesla’s Twitter account and the website were hacked simultaneously, though, points to an issue beyond a one-off Twitter security failing. It’s unclear if the hack compromised the security of Tesla’s own servers, or if the site hijacking is a result of something like DNS/domain redirection. We’ve reached out to Tesla for comment here.